Researchers have developed a sensor that could improve the monitoring of brain aneurysm treatments. Implantation of a stent-like flow diverter offers one option for less invasive treatment of brain aneurysms—bulges in blood vessels—but the procedure requires frequent monitoring while the vessels heal. Now, researchers have demonstrated proof-of-concept for a highly flexible and stretchable sensor that could be integrated with the flow diverter to monitor hemodynamics in a blood vessel without costly diagnostic procedures. The sensor, which uses capacitance changes to measure blood flow, could reduce the need for testing to monitor the flow through the diverter. Researchers have shown that the sensor accurately measures fluid flow in animal blood vessels in vitro, and are working on the next challenge: wireless operation that could allow in vivo testing. Cerebral aneurysms occur in up to five percent of the population, with each aneurysm carrying a one percent risk per year of rupturing, notes Youngjae Chun, an associate professor in the Swanson School of Engineering at the University of Pittsburgh. Aneurysm rupture will cause death in up to half of affected patients. Endovascular therapy using platinum coils to fill the aneurysm sac has become the standard of care for most aneurysms, but recently a new endovascular approach—a flow diverter—has been developed to treat cerebral aneurysms. Flow diversion involves placing a porous stent across the neck of an aneurysm to redirect flow away from the sac, generating local blood clots within the sac. Repairing the damaged artery takes months or even years, during which the flow diverter must be monitored using MRI and angiogram technology, which is costly and involves injection of a magnetic dye into the blood stream. Yeo and his colleagues hope their sensor could provide simpler monitoring in a doctor’s office using a wireless inductive coil to send electromagnetic energy through the sensor. By measuring how the energy’s resonant frequency changes as it passes through the sensor, the system could measure blood flow changes into the sac. The sensor uses a micro-membrane made of two metal layers surrounding a dielectric material, and wraps around the flow diverter. The device is just a few hundred nanometers thick, and is produced using nanofabrication and material transfer printing techniques, encapsulated in a soft elastomeric material. Because the brain’s blood vessels are so small, the flow diverters can be no more than five to ten millimeters long and a few millimeters in diameter. That rules out the use of conventional sensors with rigid and bulky electronic circuits. The researchers tested three materials for their sensors: gold, magnesium, and the nickel-titanium alloy known as nitinol. All can be safely used in the body, but magnesium offers the potential to be dissolved into the bloodstream after it is no longer needed. The proof-of-principle sensor was connected to a guide wire in the in vitro testing, but Yeo and his colleagues are now working on a wireless version that could be implanted in a living animal model. 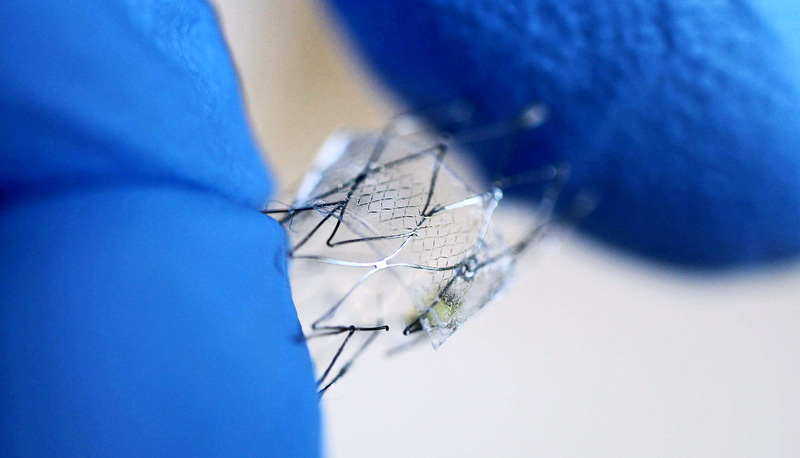 While implantable sensors are being used clinically to monitor abdominal blood vessels, application in the brain creates significant challenges. The research appears in the journal ACS Nano. Georgia Tech’s Institute for Electronics and Nanotechnology, the University of Pittsburgh, and the Korea Institute of Materials Science supported the research. Other researchers from Georgia Tech and the University of Pittsburgh, and from Virginia Commonwealth University; the Korea Advanced Institute of Science and Technology; Chonnam National University; and Washington State University contributed to the work.